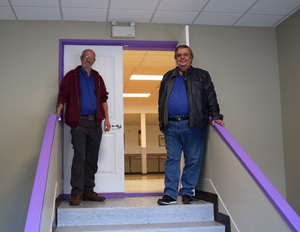 After about two years of renovations, the Elks Hall in Picture Butte has been given new life. They also changed the lights from fluorescent to LED lights, a move that helps them save money on the power bill. The Picture Butte Elks had applied for a Community Enhancement Program grant for renovating the Elks Hall. After learning they received a $32,000 grant in 2017, they worked quickly to put a new roof and sign on the building. The roof was something that needed to be replaced, as it was leaking. “All in one shot, rather then just look at this this month,” said Merle Bulycz, Elks trustee. The Elks matched the grant money they received from CEP. Bulycz said the renovations were “fairly straight-forward”. The most dramatic change to the building was the roof, said Oldenburger, as they changed the roof line when they replaced the roof, making it “look like a whole new building”. The entranceway also has a fresh facelift, as drywall is now covering cinderblock to make it more energy efficient, and the fresh coat of paint makes it look “inviting”. New laminate on the stage also makes the area easier to clean. Power plugs were installed at the back of the hall, allowing RVs that are parked back there to be plugged in. With all the work that was put into the building, both trustees are glad it’s done, and believe it will better serve the community.